Elite has four Halm Jet offset presses; three 2-color and one 4 color expressly for envelope printing of all sizes: Our Jets can print on envelope sizes from approximately 3 ½ x 5 up to as large as 12 ½ x 15. All 2-color presses feature “perfecting” capability meaning that we can print on two sides at the same time. Envelope printing can run at speeds up to 30,000 envelopes per hour depending on the job for high volume work but we’re more than happy to produce minimums on any size. Our presses are all recent models and our pressmen are some of the most capable and experienced around. How does that benefit you? Bleeds off the edge or heavy print coverage can be tricky or impossible when running on a Jet envelope printer. The skill and experience of the pressman can and often does make the difference between running such a job or not. Being able to run jobs with bleeds can save you money versus having to print the job flat sheet and convert. We run these types of jobs on a regular basis with good results. Call us for samples. We can print on Tyvek envelopes, translucent/vellum stock and other difficult substrates. 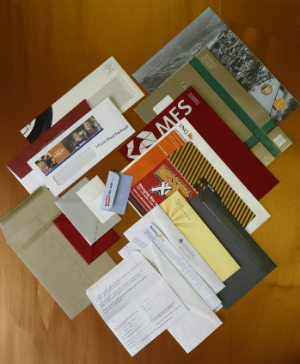 We can also print on expansion envelopes, large envelopes, and bubble envelopes and bubble mailers. 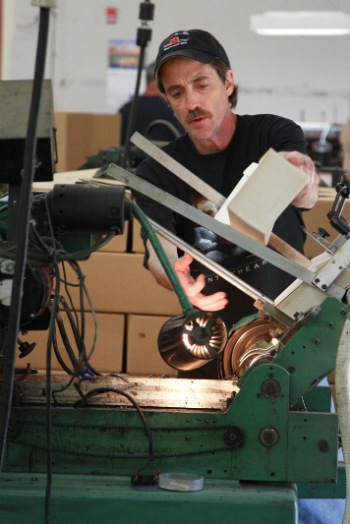 While our Jets are built for speed and high volume, we’re more than happy to print as few as 1,000 envelopes depending on your needs. With our state of the art OKI Data 5 color digital printing press, we can print outstanding color including white ink on small quantities at a very competitive price. For more information on our digital capabilities, go back to the home page and click on the "digital printing" box. Because we are an envelope converter, we can also print digitally on flat sheets and convert afterward. This could be especially useful for jobs that print on both sides. Like everything else we do at Elite, envelope printing jobs are subject to our exacting scheduling and quality control standards. You can count on getting the job on the day it’s promised and it will look great. That’s our promise to you and we stand behind all our work 100%. If you would like to discuss your particular project or needs in general, please email me Jerry@eliteenvelope.com and I'll be happy to assist you any way I can.